With much of Ibiza being known for its late-night partying, fun-filled fiestas and youthful character, the island has become famed for its summertime music festivals and live music events. There is certainly no shortage of things to do here. During the summer, many visitors to the island head straight for San Antonio, where the famous Ibiza Rocks Hotel boasts weekly concerts drawing popular groups from the UK. In the past, top acts performing here have included the likes of the Arctic Monkeys, Ed Sheeran, the Kaiser Chiefs, Madness, the Prodigy, Tinie Tempah and the Two Door Cinema Club, along with well-known DJs. The month of May heralds the arrival of the Ibiza International Film Festival, followed by Corpus Christi celebrations in June, the Dia de Virgen de Carmen every July, and the Feast of the Assumption in mid-August. Many of these events take place all over the Balearics, and so a spot of island hopping may well be in order for the avid festival-goer. There are approximately fourteen accepted public holidays in Spain, which can be acknowledged on either a local or national basis. Listed below are those dates observed in Ibiza. 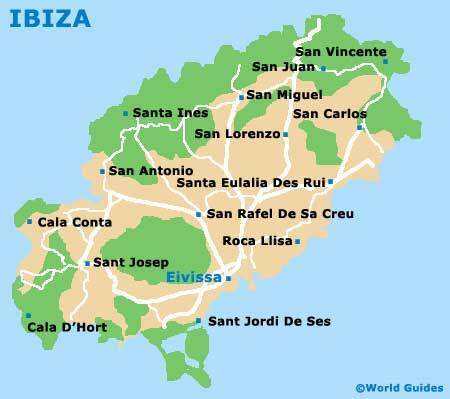 A variety of occasions are detailed for a taste of what Ibiza and its neighbouring islands have to offer. However, the already busy social calendar of the island is continually being added to.